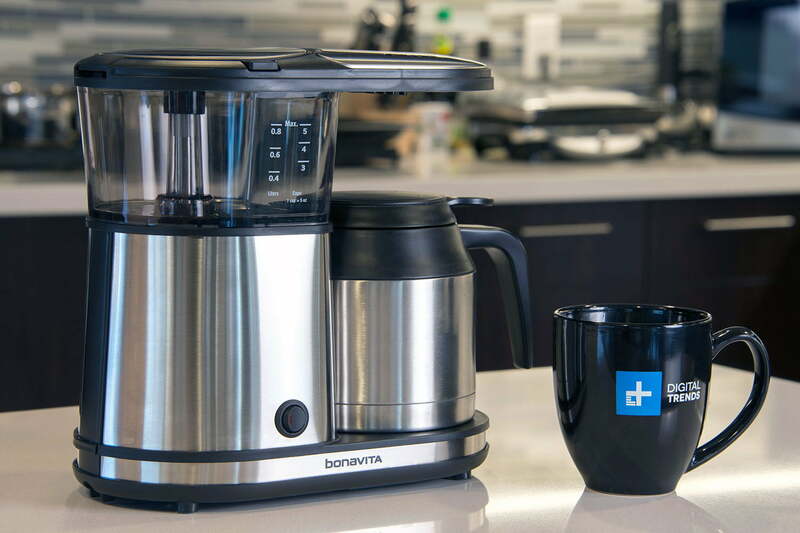 Bonavita’s 5-cup machine is meant to be an efficient alternative to the 8-cup version, but its coffee isn’t quite as good. If you’ve ever woken up at a stranger’s house (you know, because of Airbnb), then there’s a chance you’ve come across a coffee maker that requires a manual to use. Whether it’s myriad buttons or unusual functions, some machines just aren’t intuitive. The Bonavita BV1500TS is pretty easy to figure out — it has only one button — but harder to perfect. 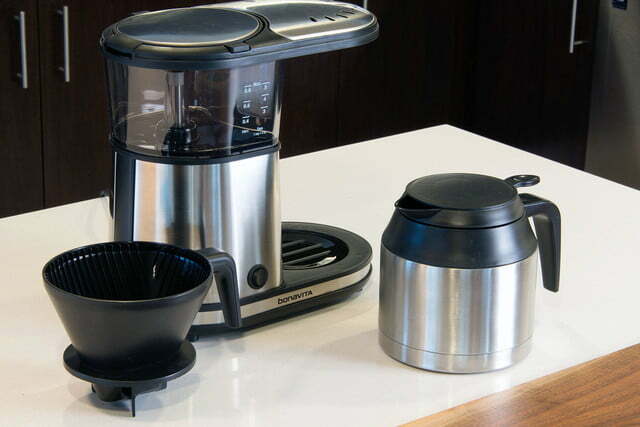 The five-cup version of the BV1900TS, one of Digital Trends’ favorite coffee makers, was designed specifically for smaller batches of coffee. It’s sleek and simple, but it took a while to find a balanced brew. We’ve had a parade of espresso machines come through the offices lately, so the little Bonavita definitely caught some attention. It’s a very nice-looking machine, mostly because it mimics the BV1900TS in a lot of ways. 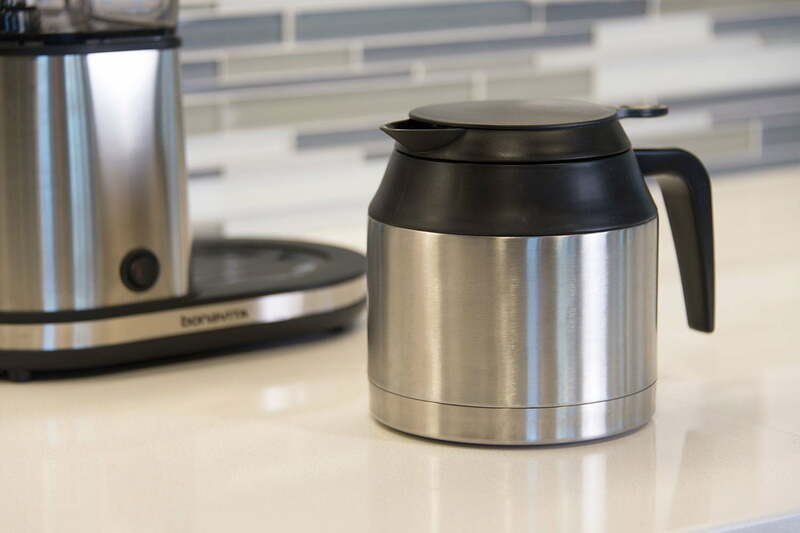 The five-cup reservoir is smaller than the eight-cup version, as is the carafe. The filter is conical instead of flat-bottomed, like the bigger machine. It’s a mix of stainless steel and plastic, with the 0.8-liter (about 27 ounces) water reservoir on one side and the brewer lid and concealed shower head on the other. 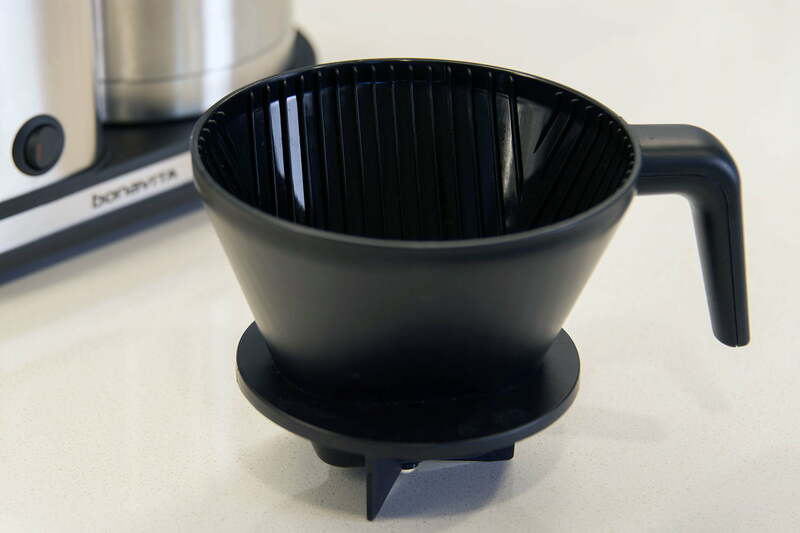 The stainless steel thermal carafe sits below, with either a screw-on lid or the plastic filter basket. If you’re trying to keep the coffee warm with the lid, you’ll have to store the filter on top of the machine, as there isn’t really another convenient place for it. Though the machine only has one button, Bonavita has pretty specific instructions for making your coffee. It doesn’t come with a plastic spoon designed to help you get the right of amount of grounds. Instead, you should have a scale handy and use 10 grams per cup, which is equal to five ounces of coffee. You’re also not supposed to make fewer than three cups at a time for “ideal extraction levels.” The Digital Trends mug I use every day holds about 12 ounces of liquid (the equivalent of a Starbucks “Tall”), and I could typically pour myself two cups from that amount, and end up with a little coffee left over. The carafe holds more than enough water to fill the tank to the “Max” line, but I always ended up slopping some over the sides thanks to the design. It pours perfectly with the lid on, but a shallow spout when lidless made it difficult to get a precise stream. 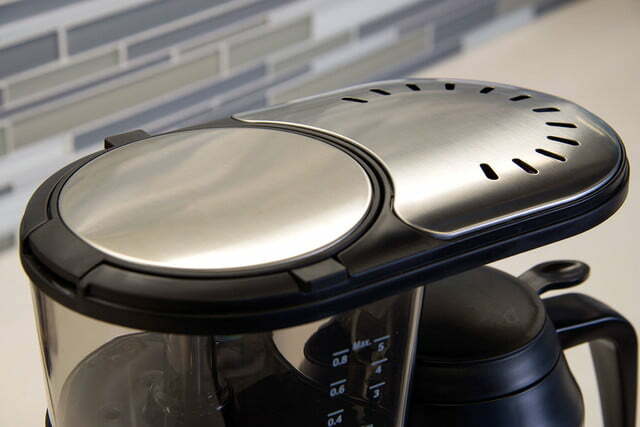 If you need coffee now, the BV1500TS makes five cups in about five minutes. Pour in the water (carefully), measure your grounds (precisely), put the filter and grounds in the basket, attach it to the carafe, flick the switch, and don’t go too far — your brew will be ready in just a few minutes. After a minute or so, the machine starts steaming through the vents and burbling. It sounds a bit like someone is blowing bubbles in their chocolate milk or like you’re diving with Jacques Cousteau. Despite Bonavita’s warning, I boldly attempted to make coffee using the volume (aka, tablespoon) method. It didn’t go well. The coffee was bitter and strong. I quickly switched to weighing the grounds and it worked better but was still a bit strong. With the BV1500TS, there’s no real way to adjust how your coffee’s going to come out, except by playing with the ratios between water and grounds and perhaps adjusting the coarseness of the grind. It took several cycles to find my perfect cup. The thermal carafe certainly did its job keeping the coffee hot. 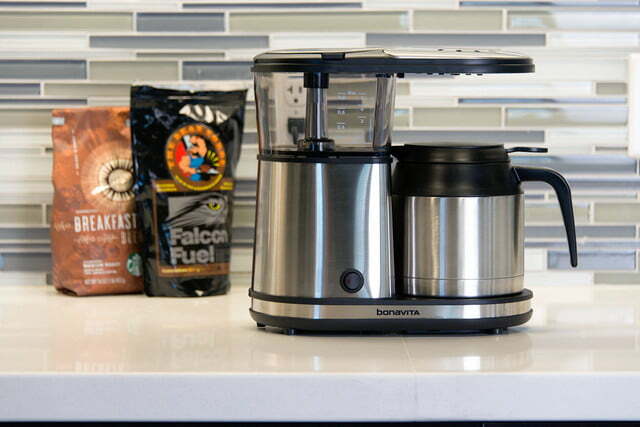 Holding down the power button for five seconds activates the “Pre-Infusion Mode,” which means it wets the grounds for a few seconds before extraction, allowing them to de-gas. It’s a feature specifically meant for freshly roasted beans, one not often found in automatic machines. If you activate this mode, it will stay on until you turn it off, by holding down the switch for five seconds, or until the machine is unplugged. There’s not really a good way to tell which mode the machine is in until you start brewing, but then the light blinks constantly if it’s pre-infusing. The thermal carafe certainly did its job keeping the coffee hot. When the coffee first came out of the machine, it was around 187 degrees. I screwed the lid on the carafe, and two hours later, the coffee was still fairly hot, around 155 degrees. After four hours, the liquid had cooled to a balmy 152 degrees. This heat retention is a crucial feature, because there’s no heating plate on the machine. 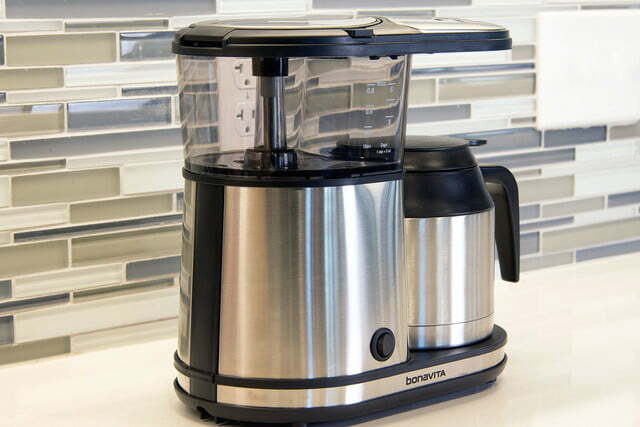 Once the Bonavita is done brewing coffee, it shuts itself off. 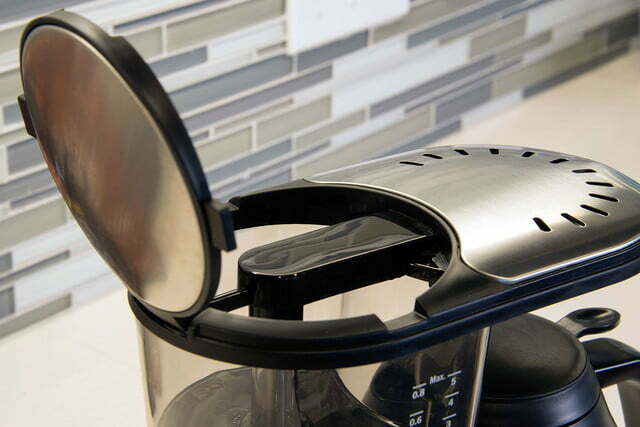 The carafe’s lid screws on and off easily, and there’s a button to push when you want to pour out some coffee. Otherwise, the carafe is pretty watertight, provided the lid is on properly. For those who like the volume method of measurement. Increase your video and picture storage with this 32GB MicroSD card. 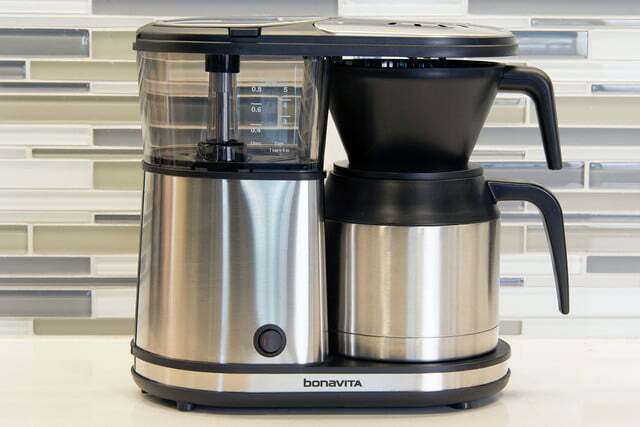 At $140, the Bonavita BV1500TS is likely to attract more serious coffee aficionados than your average drip machine. It eschews modern conveniences, like a timer or brew-strength selector, opting for two modes: regular and pre-infusion. It’s a well-constructed machine, and we were especially impressed with how well the carafe held the coffee’s temperature. Still, for a machine with only button and a five-minute brew cycle, it took time and patience to get to know. 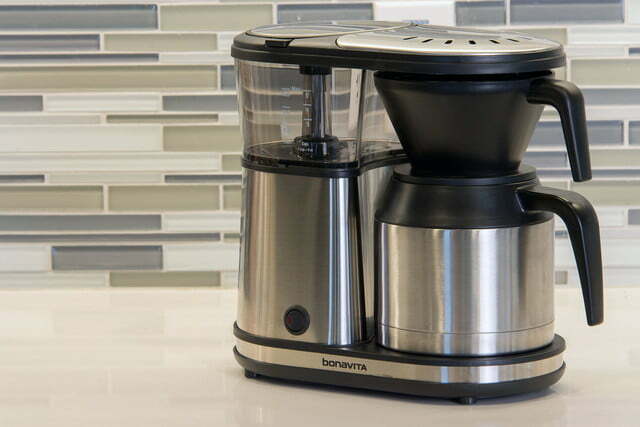 Considering it’s only $50 less than its bigger, better brother, the BV1900TS, coffee-lovers might just want to buy that and stick to smaller batches of java if they’re sipping solo in the mornings.